Teeth whitening – Teeth whitening is the most common cosmetic dental procedure. There are many over-the-counter whitening products available, but in-office whitening treatments achieve the best results in the fastest time. If you do not have time to complete your whitening treatment in-office, she also offers a custom take-home whitening system. 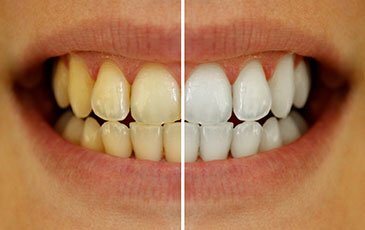 The effects of teeth whitening treatments vary depending on the condition of the teeth, level of staining and diet. Learn more about Zoom! Whitening. Porcelain crowns – A dental crown is a cap that is placed over a broken or unattractive tooth. Porcelain crowns are custom-made to match the color of your surrounding teeth. They look much more natural than traditional metal or resin crowns. The porcelain used is durable and creates a long-lasting smile for patients. We also offer same-day crowns. Aesthetic bonding – If you’re on a budget, aesthetic bonding may be the way to go. Aesthetic bonding is an affordable alternative to veneers and porcelain crowns. During the procedure, a strong resin is applied to the tooth and hardened using a special light. Patients should keep in mind that aesthetic bonding has its limitations due to the strength of the resin. Aesthetic bonding should only be used to repair decay and cracks on areas of low-pressure, like the front teeth. It should also only be used for small or temporary cosmetic fixes of color and shape. Veneers – Veneers are a popular cosmetic option to create a dazzling white smile. A veneer is a thin ceramic laminate that is bonded to the tooth. It can cover discolored teeth, gaps, stains and cracked teeth. Veneers can give patients a whiter, straighter smile for years. Veneers look and feel like your real teeth, only better. Tooth-colored fillings – Tooth-colored fillings – or composite resins – provide an aesthetically pleasing option to silver fillings. Recontouring of teeth – Recontouring is a procedure that removes small amounts of enamel to improve the length, shape or surface of teeth. It is an effective way to remove crevices and overlaps where plaque and tartar frequently build up. The procedure is most effective on minor cosmetic problems and is often used in conjunction with veneers and bonding. The effects of recontouring can be seen immediately, as it is a quick and painless procedure. Repair broken or damaged teeth – Enamel is the strongest, most mineralized tissue in your body. However, it has its limits. When a tooth breaks, chips or fractures, Dr. Moubry suggests coming in as soon as possible. 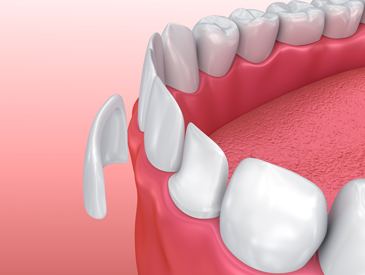 If left untreated, the tooth can become infected or damaged further. There are a number of ways to repair broken or damaged teeth including veneers, crowns, fillings and bonding. A root canal may be needed to remove damaged blood vessels and nerves in severe cases.